Auto Industry Newsletter: 2.7-litre EcoBoost: where does Ford go from here? Some years ago, somewhere deep in Ford Motor Company's Dearborn, Michigan, headquarters complex, a group of engineers and planners laid out the company's future engine strategy. Out would gradually go the tried and trusted 4.6- and 5.4-litre gasoline engines and in would come a new generation of engines which would become industry benchmarks. First, and way above anything that any one had ever done before, the engineers and planners took a giant leap into the future. They assigned compacted graphite iron (CGI) as the cylinder block material for their brand new 2.7-litre V6 turbocharger gasoline engine (below). By using CGI, with its increased strength and stiffness over aluminium, engineers could make cylinder block walls thinner and main bearing saddles narrower. Their action trimmed overall engine length and weight. Also, the cylinder block does not need liners nor expensive bore treatments such as Nikasil – Ford engineers at the Bridgend Engine Plant in the UK have had experience of this. Interestingly, Ford’s Dearborn engineers gave their new engine another new twist: they sandwiched the CGI block between aluminium cylinder heads and a thick die-cast aluminium ladder frame to further reduce weight. The aluminium cradle would replace a heavier deep skirt of iron, or an iron bedplate. Also, to further trim the weight, engineers used a moulded plastic oil pan. The Ford men knew from experience as they down-scaled their multiplicity of gasoline engines, that CGI already had given them exceptional results in terms of strength, rigidity and NVH characteristics when applied to diesel engines (2.7-; 3-; 4- and 6.7-litres) in vee-six and vee-eight cylinder configurations. CGI had brought new degrees of dimensional stability of the cylinder bore, reducing piston slap, bore wear, oil consumption and blow-by. The unique metallurgical structure of CGI ensures the material excels in tensile strength and thermal conductivity, as well as giving intrinsic internal damping for good NVH. It is through the technology of the electron microscope that the vermicular particles within CGI can be seen to be not only elongated and randomly oriented, as in grey iron, but are shorter and thicker with rounded edges, so creating stronger adhesions and improved mechanical properties. With at least 75 per cent increase in ultimate tensile strength, 40 per cent increase in elastic modulus and approximately double the fatigue strength of grey iron and aluminium, Ford engineers had already proved to themselves that CGI is ideally suited to meet current and future requirements of engine design and performance. They knew too that when it came designing a new engine they could rest assured the vee CGI engines would pass any bench tests thrown at them, avoiding any further unwanted redesign, prototyping and re bench testing. Ford engineers had found too that when CGI is applied to a gasoline engine it could shave valuable millimeters off engine length, assisting packing and saving kilos of engine weight when compared to an all-aluminium engine. The CGI block, besides being smaller and lighter, is also lithe and costs less to produce. And, looking further ahead, the block is more recyclable at the end of the engine’s life, allowing Ford to make its own contribution to a better world. Nor should it be forgotten that iron is more energy-efficient than aluminium when it comes the casting and machining processes associated with the complex cylinder block. So, with the 2.7-litre EcoBoost on the drawing board, did Ford engineers at the same time map out a replacement for the tried and tested 3.5-litre V6 gasoline engine? The 2.7-litre turbocharged Ecoboost can deliver 325 bhp (242 kW) and 375 lbft (508 Nm) torque, so engineers’ calculations might reveal the possibility of extracting 425 bhp (316 kW) from a 3.5-litre V6 configuration. More than that, from a torque viewpoint, the 3.6-litre should be capable of pushing out 485lbft (657 Nm). Both of these figures would allow product planners to eliminate the tired 5-litre all-aluminium gasoline engine from the F-150 powertrain line-up. In this application, the 5-litre engine is rated to deliver 385 bhp (286 kW) and 387 lbft (524 Nm) of torque. However, it has to be conceded the elderly 5-litre engine has given much more performance, but mainly in short-duty cycle applications, such as the Shelby 500 in which has been rated to give as much as 550 bhp and 500 lbft torque – 410 kW and 678 Nm respectively. 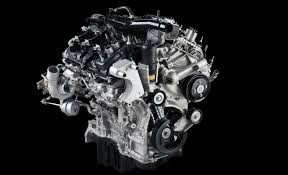 The net result of creating two new engines would allow Ford planners to make two gasoline engines (the 2.7- and the 3.5-litre turbocharged EcoBoost V6 units) feature in F-150 pickup truck spec sheets, where previously (for 2016 model year) there were four: 2.7-litre V6 EcoBoost; 3.5-litre V6 EcoBoost; 3.5-litre V6 Ti-VCT and the 5-litre V8 Ti-VCT. This is an important company-wide consideration in terms of plant utilisation, cost savings and product simplification. The addition of the new 3.5-litre V6 EcoBoost besides saving engine length and weight, would have important knock-on effects across the entire vehicle package in terms of fuel economy and tailpipe emissions, as well as in Ford's energy balance. The coming 3-litre V-6 for Lincoln Continental is also built on the same CGI-block from the 2,7 L EcoBoost. This is confirmed from Sintercast, the tech-provider of this CGI. I think Ford will keep CGI-blocks flooding over the coming petrolengines and I hope that they will make these more efficient from a MPG point of view.